The child stars of Stranger Things received quite the scare during their Good Morning Britain interview today (October 26). 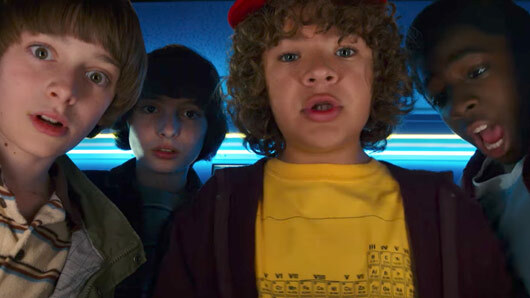 Millie Bobby Brown and Noah Schnapp appeared on the ITV breakfast show this morning to chat to Richard Arnold about the upcoming season of hugely popular Netflix series, Stranger Things. Little did they know, however, that the producers had a spooky Halloween prank up their sleeves. Midway through the interview, a masked, cloaked figure burst into the room, giving the 13-year-olds the fright of their lives. Jumping out of their seats, Eleven actress Millie screamed while Noah, who plays Will Byres, yelled: “Holy crap! Once everyone had recovered from the shock, the Stranger Things cast revealed what it is like to star in the series. The second season of Stranger Things will be split between the real world and the Upside Down. For those of you who are unfamiliar with what that is, Noah gave an explanation. “It’s like an alternate dimension,” he said. “It’s the same exact copy of our world but upside down. It’s scarier and darker. Stranger Things 2 lands on Netflix tomorrow (October 27).